OK, right off the bat: I’m not an old person. Not even close. But I see the signs of age beginning to show, and it feels…weird. Part of me looks forward to getting older. Once you reach a certain age, it seems like you’re practically given a free pass, and you can do or say just about anything you want. That’s pretty cool. Still, there’s also a reluctance to aging. Like you’re past your prime somehow. Physically, it’s an inevitable truth. My wife pointed out that I made a host of involuntary grunts getting up from my chair the other night. That’s right, I wasn’t doing anything particularly strenuous, I was simply getting into a standing position. Now that it’s been brought to my attention, I notice I do it almost all the time. I really have no idea how long I’ve been doing it. It doesn’t bother me that much, it’s just one of those things. What really makes me feel old are the random things that just hit me out of nowhere. Pop culture references, and recalling things from my past. I was talking to someone at work about seeing Metallica in concert. He asked me when it was, and I had to think for a minute. I started thinking, and realized I was right. It was 1988. 25 years ago. How can that be? It seems like it was a few years ago, but 25? During my music-loving, concert-going peak (from 1986-2000), I devoured music. I was constantly finding new bands I liked, going to shows to see both local and national acts. I would hear older guys complain that the music my friends and I liked was nothing compared to the classic rock of the sixties and seventies. I thought that was so closed-minded. I’ll never be like that, I thought. Guess what? I’m almost like that. I know there are all kinds of new acts out there that are fantastic, and I try to seek it out (I really like what I’ve heard from Jake Bugg, if anyone’s interested), but it’s so easy to just call upon my vast iTunes library and have a plethora songs I already know I like. Then I watch the Grammys and I hear the nominees for a category and just stare blankly at my wife – who are these people? Then there’s all the actors and actresses who you see age before your eyes. Seeing someone getting older means you are, too. It’s just something we have to accept – except Kevin Bacon…is he really turning 55 this summer? All I know is, getting older is a part of life. Some of us aren’t ready for it when it comes, but I am. I think some of my best years are still ahead of me. I’ll turn gray (grayer, I should say), I’ll groan when I get out of bed or pick something up off the floor, but by and large, I’m looking forward to what is still out there for me. 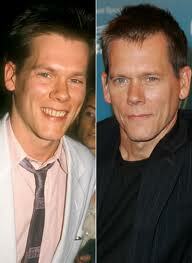 And whether I like his work or not, Kevin Bacon can just stick it. Stupid unaging space alien. This entry was posted in Other and tagged A-Z Challenge, aging, Jake Bugg, Kevin Bacon, Metallica. Bookmark the permalink.